Tucked away in Woodbridge, Fresh Cut Flower Farm is making a name for Detroit in the locally grown flower community. Read our #JadoreExclusive phone interview with Owner, Sarah Pappas, to learn how she focuses on sustainably improving her footprint instead of growing her footprint. Sarah: "Fresh cut is a flower farm in it’s fourth season, in Woodbridge at Rosa Parks & Forest. I’ve been doing this kind of work in some shape or form for the last ten years. I try to work hard to be conscious, grounded, positive and reciprocal. The farm is going great, this year we have four people in crew and two youth harvest crew members. This year is really about infrastructure development and making the most out of our foot print. I want to grow the business by producing more beautiful and rare flowers. We bought our house and the three adjacent lots with a conventional mortgage four years ago. Over the course of several years I was able to purchase three additional lots that surround the property. We would like to the rest of the lots on the block to be secured as the community garden that already operates, park space, and habitat for the pheasants and bunnies that live there. We're in talks with the Land Bank. As the neighborhood has more economical desire, I don’t want to see the neighborhood losing eco diversity. We’re in the planning stages of putting a monarch habitat on one of our properties." J'adore: How did Fresh Cut start? Sarah: "I was working for one of the nonprofits in town, farming for Keep Growing Detroit. My husband and I were ready to buy a house with land. I was keeping an eye on the national trend of small businesses and fresh cut flowers. 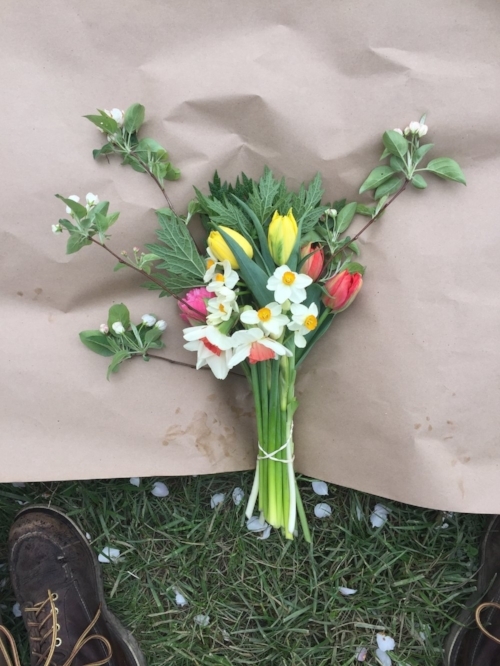 Locally grown flowers are gaining in terms of demand and it made sense to open our own farm." J'adore: What does your yearly routine look like? What are you doing in fall, winter, spring, and summer? Sarah: "In the fall, we staff up a little to get big projects done like planting bulbs, laying out new pathways, investing in next year. In the springtime we harvest the bulbs and work on early marketing, bed planting, and have a rigorous planting schedule after week 13. In July, August and September we’re jamming. Winter slows down and there’s more time to spend with family and work on professional development." J'adore: Do you have plans for expansion? Sarah: "A lot of it has to do with jobs. We want to keep our footprint, or lot size, the same while creating more jobs. We’ve been hiring people in different ways, this year we’re able to provide a stable livelihood to people. It’s unbelievable how many amazing applicants with great experience have applied. Our assistant manager returned from last year. We want to focus on managing and selling products better to provide more jobs. It’s our driving force." J'adore: Where can people buy your flowers? Sarah: "All around town! This week is the end of our climate change super sale. Things are blooming a lot earlier than we expected. You can pick your own stems from the Farmer’s Hand this summer for $1 each. We do a lot of special events and weddings. We also have a weekly bouquet service in the spring and summer. The spring service is almost sold out, but the summer 10 week bouquet service is still available!" J'adore: What is the weekly bouquet service? Sarah: "We offer pick up or delivery, we charge a lot for delivery to get you to the farm to pick it up. When you come to the farm you can choose what bouquet you want. We like to flex our design muscles with the weekly bouquet service and try new things- we do amazing work with texture and foliage. The service is a really great way to have a beautiful reminder of the place and time you’re in each week." J'adore: Who do you partner with in the city? Sarah: "Oh Geez, so many people! For the Climate Change Super Sale, everyone selling for me is a friend. I partner hard with the urban agricultural community. I buy supplies from Detroit Farm and Garden. Made Floral at Shinola is the only florist I’m selling to currently. I would love for people to go into Shinola and ask for “Fresh Cut Detroit” by name. My drive is to increase the demand for locally grown flowers- we have so much room to grow it." J'adore: How is Detroit for growing flowers? Sarah: "It’s great! My model for growing is a great fit, I don’t depend too heavily on one type of crop. Having one crop is always a risk, our strength is having a diverse variety of flowers." J'adore: What are three essential gardening tips you can you share with J’adore readers? 3. Diversity is key, create a habitat for all types of pollinators, if one thing fails something else will succeed!" J'adore: What do you want people to know about Fresh Cut that they might not know already. Sarah: "We're open to the public every Thursday evening 4-8pm. It's a great time to see the farm, smell the flowers, and play with the dog. We’re located at the corner of W. Forest Ave & Rosa Parks in Woodbridge, Detroit, 48208." Check out the farm for yourself On Thursday Afternoons and make sure you ask for "Fresh Cut Detroit" next time you're in Shinola! Keep the weekly bouquet subscription in mind for Mother's Day- talk about the best present ever. Or, Pre-buy a Special Mother's Day Bouquet and pick it up from the farm on Friday, May 12th for $20. Where to go and What to do on the Q Line.